It was cold overnight, but not as cold as we anticipated. It was surprisingly relatively mild (upper 30s) compared to the the frozen fingers start I expected this morning. Gavin and I got going at 6:35am and continued with the great Under the Rim Trail of Bryce Canyon. 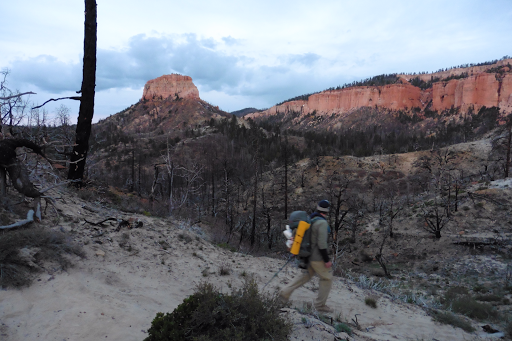 The first ridge we went over immediately brought us into a burn section that lasted an hour or so. It was interesting lighting this morning with low level clouds that gave a hazy look with a darker blue that I am a fan of. 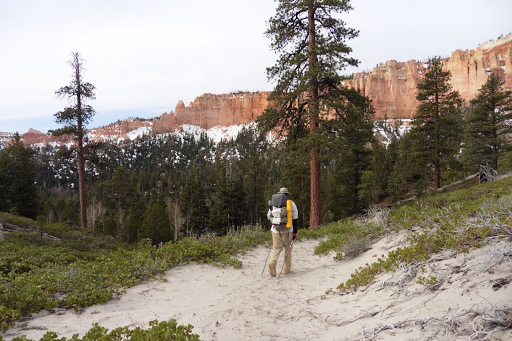 The Under the Rim Trail continued its pattern of gentle contouring on actual trail, extended ups that then would crest a high point (around 8,000ft), to then reveal another great view and contour down before repeating the cycle. 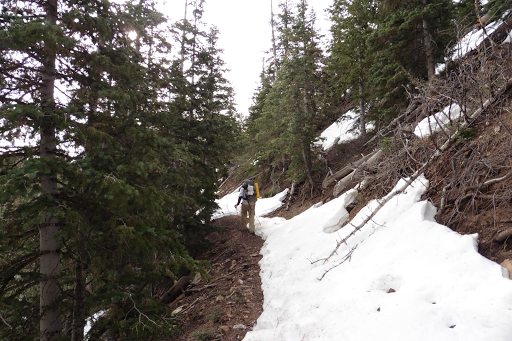 You can see that there is still plenty of snow along the Rim. I love this kind of hiking and we totally cruised all morning. Every so often, there was snow, fallen trees, or a washout, but it was mostly smooth sailing and nothing like the Hayduke we’ve gotten accustomed to. Technically, we weren’t on the HDT for the last two days since this is an alternate to include the heart of Bryce that adds about 25mi overall and has us missing 10mi of the original HDT. 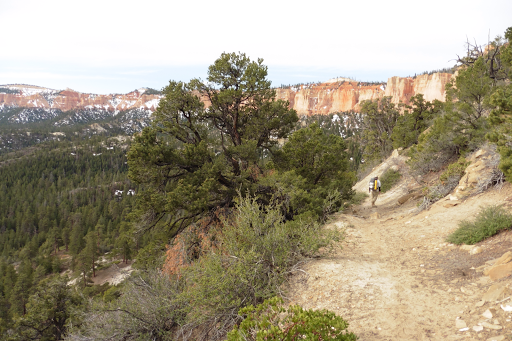 The trail rejoined the HDT this morning, so some of the Under the Rim Trail is on the HDT. I was totally in my element and really enjoyed the bonus of the great cooler weather and overcast with also billowing white clouds that stuck around most of the day. 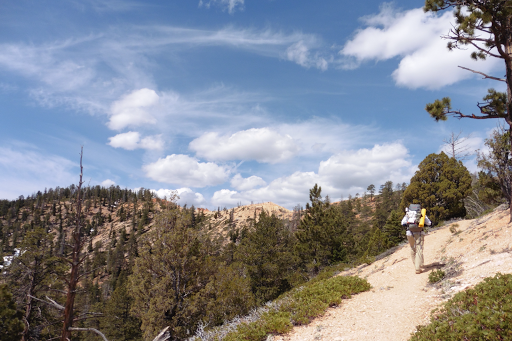 At lunch, we decided to take a short detour of .2mi up to a viewpoint called Rainbow Point just over 9,000ft. The ridge walking on the way up was great and the view looking back showed the rim we had just spent the last 24hrs walking along. Pretty cool! We knew it had a parking lot, but didn’t expect it to be so packed with tourists on a Wednesday. We headed over to the main viewpoint to each lunch on benches and We were surprised to see Katherine was there too. We overlapped for lunch and Gavin and I hiked on as she hung back a bit longer. We are all doing what we can to give Katherine her solo experience, but I feel bad that of all trails to be in a hiker bubble, it’s happening on the Hayduke and we’re really trying not to. She knows it isn’t intentional, but I know it messes up the solo thing to keep seeing other hikers. Much of the rest of the Hayduke will be less cross country and more on developed trails and roads like today. I kinda miss the more adventurous stuff and we found ourselves unintentionally doing faster miles. It’s like cruising on autopilot. The water sources were pretty meh today, so Gavin and I kept passing on the very shallow and low quality ones hoping the next one would be better. They were all doable, but would have been time consuming. We knew there was a metal tank that seemed reliable on a short road walk alternate in the afternoon. When we got to what we thought was the tank, it was bone dry and the spigot was off. Dang it! We had a maybe source a few miles further, but if it was dry, we’d have to push to another one three miles after that to make a longer day than we needed, but doable. We had passed a random cache of water in jugs a half mile back, and not knowing the reliability of the water ahead, we chose to hike back to the water jugs. Just as we started to do that, Katherine hiked up and had updated water info (which I left in town with my maps) that gave us more confidence in the sources, so we didn’t hike back. 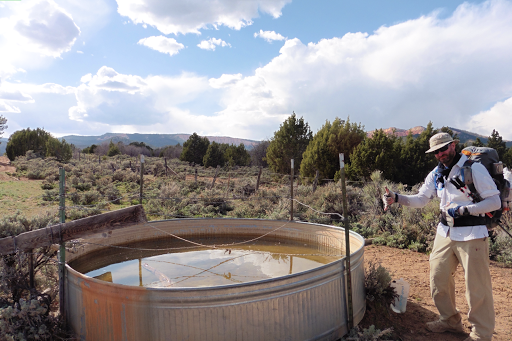 Then we hiked and saw a full tank a half mile up…later Katherine told us there was even a better source with a pipe we apparently walked right past…of course! Katherine took a break and we hiked the final three miles to the source to setup camp at 6:10pm. Katherine arrived a short time later and is camped just neighboring us along the water source, but far enough to have some solitude. 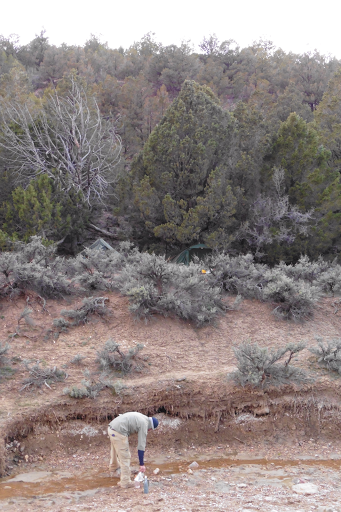 You can see our tents just above the wash on the shelf behind the bushes.